I wrote this blog over 10 days ago and didn’t post right away because I was waiting for some pictures to go with it. In the meantime, my computer went all haywire. Finally got that fixed – no easy task being so remote. Here’s the recap of our first couple of groups – ENJOY! Our 2017 season is off to a fantastic start this summer. We’ve had two groups of guests join us so far and they just can’t get enough of the fantastic fishing, food and fun. WEATHER: The first week’s weather at the Anvik River Lodge was a little rainy for a few of the days. We didn’t mind though because the water levels were a little lower than normal for this time of the year. And a little rain didn’t hamper the angler’s spirits or the fishing opportunities. This past group of guests were blessed with better weather for sure with temps in the mid 60’s to low 70’s. Even had to use sunscreen a day or two. Jeff looking happy with this beautiful Anvik River chum salmon caught on the fly. 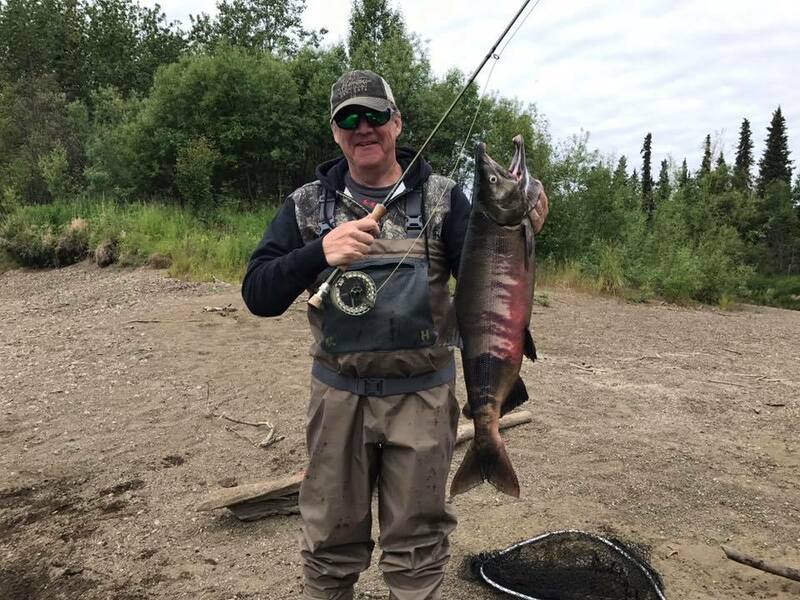 FISHING: As of today the State of Alaska Fish and Game sonar shows 250K + summer chum salmon have passed by their counter on the Anvik River. The king salmon and sockeye salmon are showing up and there’s been a few caught this past week. The arctic char & arctic grayling continue to be abundant and really good sized. The pike fishing has been pretty good, whenever there’s a weather change, they are affected for a day or two as usual. They always look like dinosaur fish to me. GRAND SLAMS & CENTURY CLUB REPORT: An Anvik River Lodge grand slam consists of catching one or two salmon species, a pike, a char & a grayling all in one day. This is a great way to explore the diverse fishery available in the remote wilderness. For the 2017 season we’ve inducted 6 women & 15 men anglers & 1 ten year old angler (Luke) who incidentally got his all on the same lure I believe. Another fantastic feat was performed by Tom who is 84 years old and legally blind – he got one of his grand-slams all on the fly. He also caught an Anvik River Lodge grayling on his 97 year old bamboo rod that has been passed down in his family for a few generations and has been used all over the world in various waters. This was its first time to Alaska – very cool. 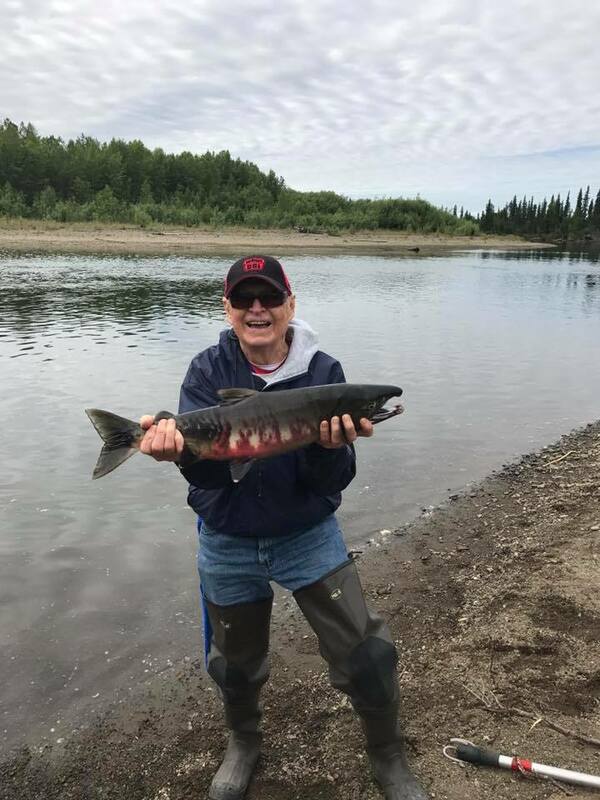 84 year old Tom showing off his fine Anvik River Lodge Chum salmon! An Anvik River Lodge Century Club is when you catch 100 fish in one day – we don’t have very many members of this club that we started about three years ago. But we’ve got one more from our first group of guests this season. 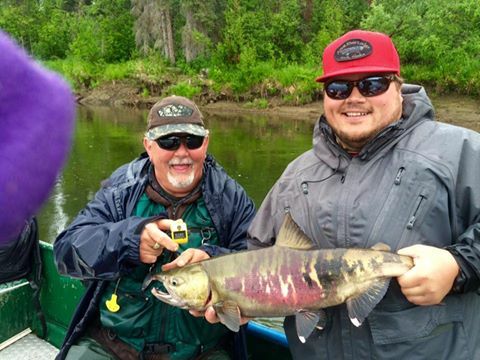 A big congratulations goes out to Bill Simpson of Soldotna, Alaska for catching over 100 fish in one day! Great Job! Until next time everyone – we’ll keep a line in the Anvik River with your name on it! Anvik River Lodge’s newest Century Club inductee. 100 fish in one day! We’re really glad you two can make another trip up here – see you soon! Great blogTomis still talking and sharing his trip with Jeff Thanks for everything. Wonderful – we sure enjoyed having them both up here!